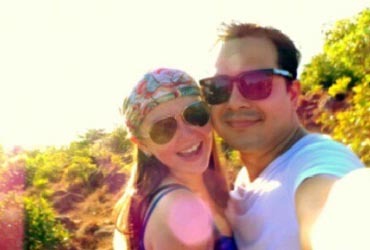 Angelica Panganiban and her boyfriend John Lloyd Cruz spent their holyweek holidays in Ariara Island, located in Calamian, Palawan a luxurious private island getaway. She even happily shared some photos of the beautiful moments they had in her instagram account. Recently the actress posted and revealed about their holiday destination, "Sabi nila it's lonely at the top...pero kung ikaw naman ang kasama ko, bongga na din. #AriaraPrivateIsland you're the best lab!" she wrote. In her official insta-account in social-networking site, Panganiban had live updates and she first posted a picture of John Lloyd wearing a pink polo shirt, reminiscent of the actress' "Perfect Sunday" post last year, together with a caption that stated: "The guy in pink...is still...the guy in pink. Di na siya nakapagpalit since then :)," as if to say that their relationship has only grown stronger since the time they started going out. Later on, Angelica posted a photo collage of John Lloyd together with his family and relatives at their holiday destination, "Hanapin niyo kami!!! This is life! Wala pa man!" Then Angelica posted their photo together, sunbathing after hitting the beach, and she wrote a caption, "Doing sit ups love?" Hehehe. You always give me memories and more wisdom, lalo na pag malalim na ang hugot natin. Best summer ever! Sa maraming aspeto. We cannot ask for more. I love you!" It could be remembered that Angelica previously revealed in her The Buzz interview that she and John Lloyd rarely saw each other when he was shooting the movie “It Takes A Man And A Woman”. But during the Holy Week break, the actor obviously made up for lost time between them.